In this book Jenny showed what happens when one takes various materials like sand, spores, iron filings, water, etc., and places them on vibrating metal plates. What appears are shapes and motion - patterns which vary from the nearly perfectly ordered and stationary to those that are excitingly chaotic and constantly in motion. Jenny created an invention of his own called a tonoscope which made use of crystal oscillators to set these metal plates into motion. Unlike in previous experiments. Jenny could precisely control the rate of vibration and repeat experiments attaining identical results. "The tonoscope was constructed to make the human voice visible without any electronic apparatus as an intermediate link. This yielded the amazing possibility of being able to see the physical image of the vowel, tone or song a human being produced directly. Not only could you hear a melody - you could see it." 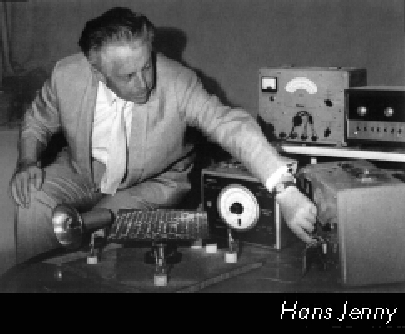 One of Jenny's most interesting results with the tonoscope was produced when he took a vibrating plate covered with liquid and tilted it. "The liquid did not yield to gravitational influence and run off the vibrating plate but stayed on and went on constructing new shapes as though nothing had happened." If, however, the oscillation was then turned off, the liquid began to run. But if the tonoscope was turned back on and the vibrations re-established, quickly, before the liquid ran off the plate he not only could prevent the liquid from leaving the plate but actually set it back into its original position. According to Jenny, this was an example of an anti gravitational effect created by vibrations. Jenny, also, pointed out the resemblance between the shapes and patterns we see around us in our physical reality and the shapes and patterns he generated in his experiments. Jenny stipulated the theory that biological evolution was a result of vibrations. In his book, Jenny says that the key to understanding how we can heal the body lies in our understanding of how different frequencies or "tones" influence our physical reality. Cathie E. Guzetta, "The forms of snowflakes and faces of flowers may take on their shape because they are responding to some sound in nature. Likewise, it is possible that crystals, plants, and human beings may be, in some way, music that has taken on visible form."